TestingTime » UX Blog » Usability, UX and CX compared – should you optimise them all at the same time? 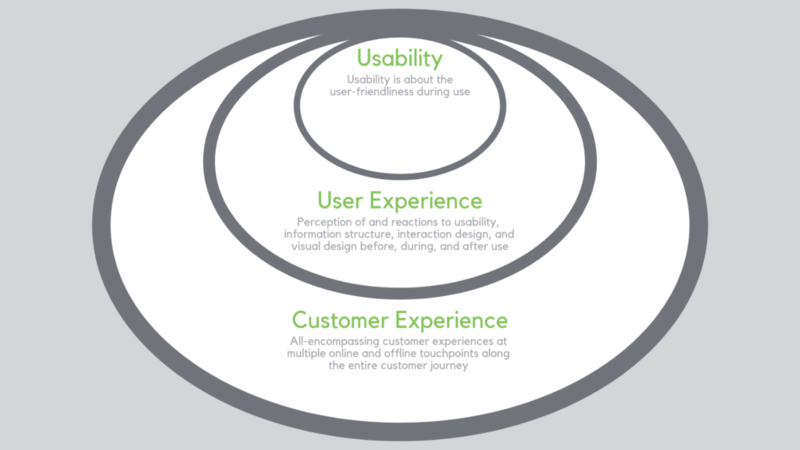 Usability, UX and CX compared – should you optimise them all at the same time? Terms like usability, UX (user experience) and CX (customer experience) are on everyone's lips. Yet in many cases, not everyone is aware of the differences between these three disciplines, and stakeholders incorrectly believe them to be the same thing. Many businesses also assume they have to take into account and master all three disciplines as best they can to develop or optimise their products and services. In this article, I will go into the major differences between usability, UX and CX. I will demonstrate when each of the disciplines are actually relevant to you and your business. We will also look at the role the so-called UX maturity level of your business plays in conjunction with the optimisation of usability, UX and CX. With correct classification of your business’s maturity level, you avoid getting bogged down in complex optimisation measures and wasting valuable resources. Usability describes the degree of user-friendliness or serviceability of digital products such as websites, online shops or apps during use. It is determined by the extent to which users can effectively, efficiently and satisfactorily achieve their goals in a particular context of use. However, a digital product with good usability doesn’t automatically mean that it offers a good user experience too – as usability is just one of several aspects of the overall user experience. The user experience of websites, apps or software in turn comprises the perception and reactions of users to the usability, the information architecture, the interaction design and the visual design – before, during and after use. Due to these different components, creating a good user experience is inevitably more complex than simply creating good usability. After all, as mentioned in the previous section, usability only describes the degree of user-friendliness during use. By contrast, customer experience goes well beyond the usability and user experience of websites, apps or software and comprises digital and physical products and services which range across multiple online and offline touch points throughout the entire customer journey. 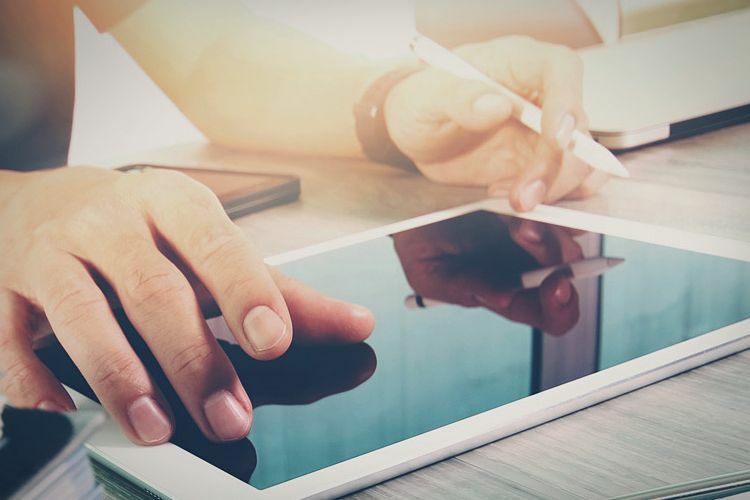 In contrast to usability and UX, CX testing also involves comprehensive testing of aspects such as advertising impact, the online and offline search and ordering process, product delivery, customer support and brand perception. The following graphic demonstrates the relationship between the three disciplines. Usability is one of several aspects of user experience, while usability and user experience in turn are aspects of customer experience. Likelihood that competitors create a better customer/user experience. In the following matrix, you will find the five maturity indicators classified in five different forms. This maturity matrix helps you make a quick and realistic self-assessment of your business’s status quo. Read through all the maturity levels with their different characteristics in order to then assign your business to the closest applicable maturity level. As previously mentioned, your business’s maturity level plays a key role in the question of how you measure and progress your activities with regard to usability, UX and CX. In addition to the maturity matrix, the following graphic demonstrates once again which of the three disciplines is typically used in which maturity level and where you should set your current level correspondingly. Companies with a low maturity level by nature have very limited budgetary and personnel resources. Usually, they also have little experience with testing. Accordingly, it is worth starting with usability testing that’s relatively easy to implement. With pure usability testing, you avoid complex test situations and can gain initial experience in optimising the user-friendliness and serviceability of your digital product during use. 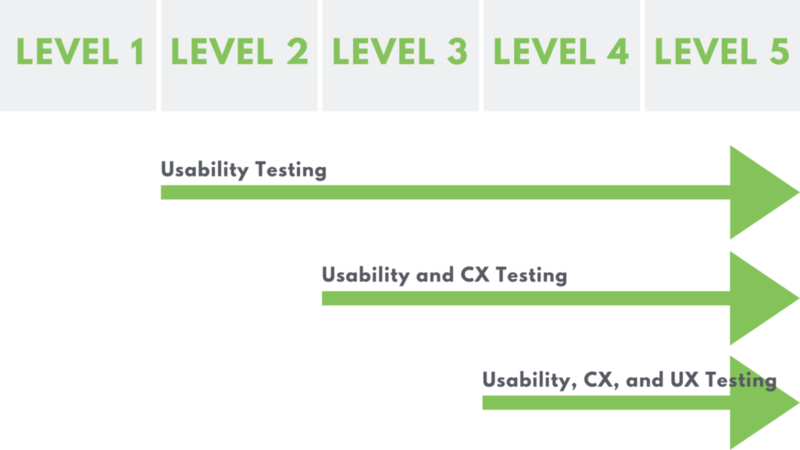 From maturity level 3, UX testing and user research are usually relevant for businesses. At this point, they have already obtained experience with pure usability optimisation. Now, your testing and research situations already involve optimising perception and reactions before, during and after use of the product. From maturity level 4 or 5, companies with the relevant experience typically begin by expanding their testing and research activities. They cover multiple touchpoints of the entire customer experience, including digital and physical products and services. For example, let’s say you were to assign your company to level 2. Using the above maturity matrix, it would be way too early right now to implement much more complex UX and CX testing. This is because CX testing requires a lot of experience with different UX methods. And user integration in various phases of the product development process. 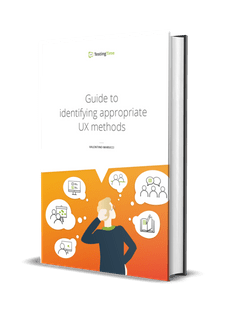 Be aware that systematic integration of usability, UX and CX testing into product development requires both methodical and organisational expertise. And that becomes more demanding with every maturity level and builds gradually. You should therefore only focus on reaching the next maturity level. You don’t want to overload yourself and your stakeholders with testing and research situations which are too complex. Tap into the relevant testing disciplines according to the maturity level of your business. Give your business the chance to grow into professional usability, UX and CX testing organically – from one maturity level to the next. The higher your business’s maturity level develops gradually, the more complex and better interwoven the processes will be that make usability, UX and CX a permanent component of your product development.